The current day median is the median of all trade prices of a security for the current day’s trading session. The median is a more robust central tendency compared to the VWAP and is less sensitive to outliers. The median calculation is performed on volume-weighted time price opportunities (VWTOPs). Alternatively it can be based on time price opportunities (TPOS), when no volume data is available. The current day median is the value separating the higher half of all data points from the lower half. Applied to the Current Day Median, this means that half of all trade transactions of the current day’s trading session were contracted above the median and half of them below the median. 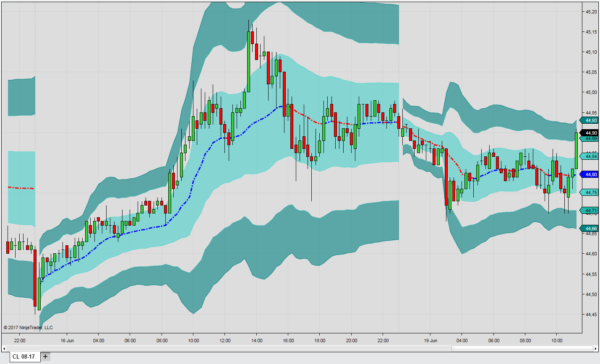 The main advantage of the median over the VWAP is that it is not skewed by extremely large or small values. The Current Day Median can be set to calculate for the entire trading day or it can be set to calculate for custom hours such as the regular session. The median calculation is more accurate when it is based on VWTPOs. TPOs should only be used when no volume data is available. The Current Day Median further comes with residual mean absolute deviation bands. In order to make them comparable to standard deviation or root mean square deviation bands, the multipliers have been adjusted by a factor of approx. 1.25. Please change the multipliers as needed. The median is best used with the setting “Calculate” = “On price change”, as it is not necessary to recalculate it with each incoming tick. The indicator that can be downloaded here will calculate an accurate median price and accurate bands when applied to high resolution charts. When used with higher timeframe charts, the plots may be one or a few ticks off the correct value. Accuracy will be good on a 1- min chart after the first hour counted from the anchor point.